Tapang Damulag (Delectable Filipino style jerky made from carabeef or carabao "water buffalo" meat slice) is eminently more affordable and accessible. Try it as main dish or as pulutan and surprise your guests! 1. Season beef with salt and air dry for 5 days. 2. After 5 days, cut into strips and fry. 3. For Atchara, combine all ingredients and chill for 3 days before serving. 4. For Java Rice, combine turmeric and annatto powder. Mix well. 5. Put-in garlic powder, onion powder, and salt. Stir until everything is distributed. 6. Pour-in mixture on warm steamed rice. Gently mix so that the rice is coated by the mixture. 7. 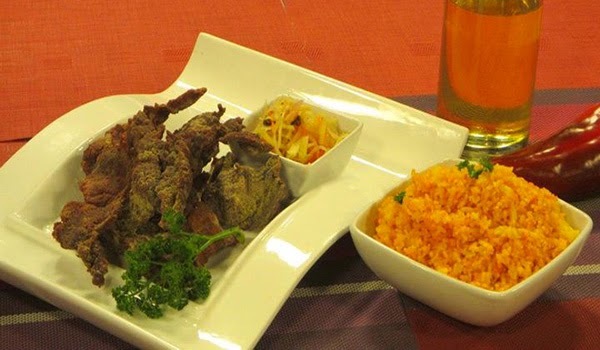 In a serving plate, place strips of tapa, add atchara on the side and serve together with a cup of java rice.